When it comes to social networking, Facebook is king. If you’re at all involved in social media or social networking, you’ve probably tapped into Facebook, and you’ll want your iPad to help you make the most of it. 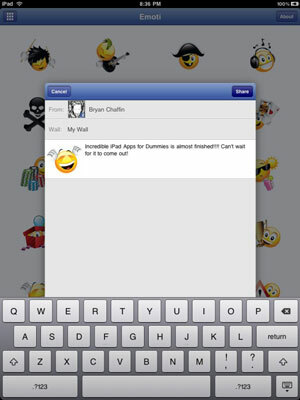 With Emoti HD, you can use your iPad to add great-looking emoticons when you post to Facebook. 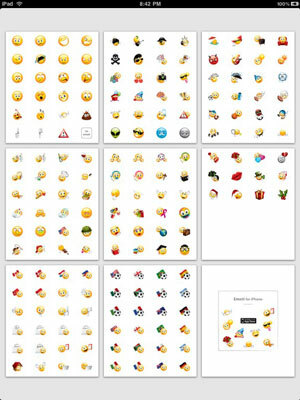 Emoti HD for Facebook currently has 186 emoticons that were custom-made by the developer. They look great on both your iPad’s display and on Facebook in any browser. To make a post, tap an emoticon (or “no emoti” if you don’t want to include an emoticon) to get a keyboard and entry field. You can pick your destination by tapping the second field labeled Wall. Write the post, tap Share, and you’re done! If you’re looking for a more Facebook-like way to use the service on your iPad, you can use Friendly — Facebook Browser. Friendly offers an interface built for the iPad. 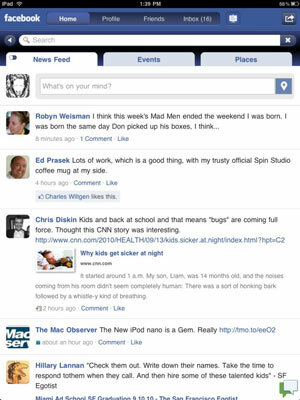 In the main page for the app, you can get your news feed from all your Facebook Friends. You can also click to your live feed, view your profile, and even chat with other Facebook users. In short, it’s Facebook — but you may have noticed two things I haven’t mentioned: Facebook games and ads. Neither one is offered in the app — Friendly is focused on interacting with your Friends. With Qubical, you see all your Facebook friends not as names in a list or in a time line, but as faces on a 3D cube that you can zoom in on and rotate. Tap one of the images on the cube to pull up the name of a particular Friend, double-tap it to pull up that Friend’s status updates or to write on his or her wall! It’s a very different way of browsing Facebook that may appeal to people who are more spatially or visually oriented.